This building was designed and manufactured for the California Department of Fish and Game. Utilizing 4 hour bi-directional fire rated noncombustible weatherproof construction, the building meets or exceeds UL 263 & ASTM E-119. 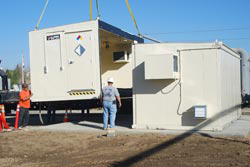 Due to the large 324 square foot size of the building, it was delivered in two halves, each half containing specific configurations and accessories based on specific needs of the intended use of the building. 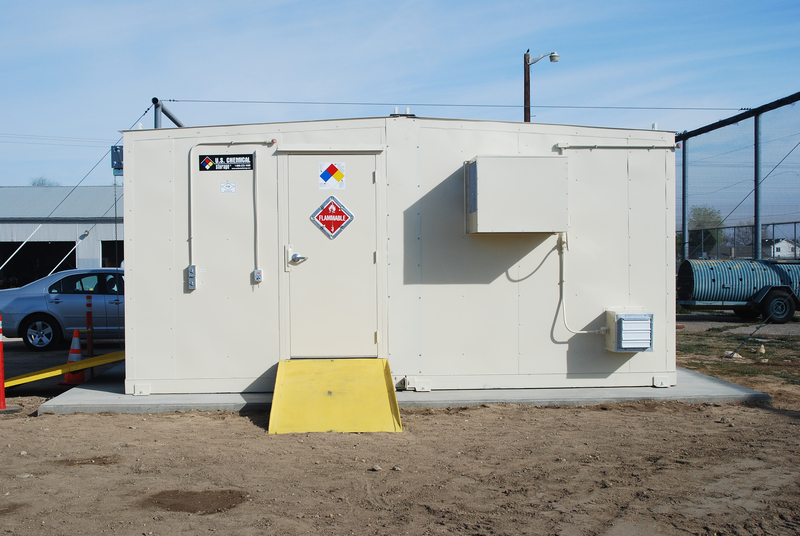 The full storage capacity is 144,000 lbs and consists primarily of virgin chemicals. Upon arrival, the protective covering on the building is removed and then it is offloaded on site with a crane. Each half of the building is positioned to facilitate combining into one structure. The wall construction includes mineral wool insulation and multiple layers of UL Classified fire-resistant gypsum wallboard encased between interior and exterior heavy gauge Galvanneal sheet steel for maximum durability. Wallboard layers are offset with overlapping joints for maximum fire resistance and conform to NFPA 30 standards. The roof system meets a 4 hour fire rated Class A flame spread rating, wind uplift that exceeds UL Rating I-60 and is constructed of the same weather proof non-combustible construction as the walls. The floor consists of fiberglass T-bar style grating and a leak proof spill containment sump. The sump is fabricated from continuously welded 10 gauge steel sheets for maximum spill containment and coated with a chemical resistant epoxy. Some of the accessories used in this building include convection heater, explosion proof refrigeration unit, explosion proof incandescent light fixture, standard electrical load center, single door with panic hardware, rollup door, dry chemical fire suppression system, combination shower/eyewash station, and loading ramps. This project takes into consideration and meets all of the latest California and NFPA compliance codes and regulations. These include the building codes for mechanical, plumbing and electric. The building complies with NFPA standards for flammable and combustible liquids, dry chemical extinguishing systems, and fire doors and windows.